Since we have been enjoying our "Savebucks" Protein Bistro Box, I knew I had to remake some of the other bistro boxes. Next up? 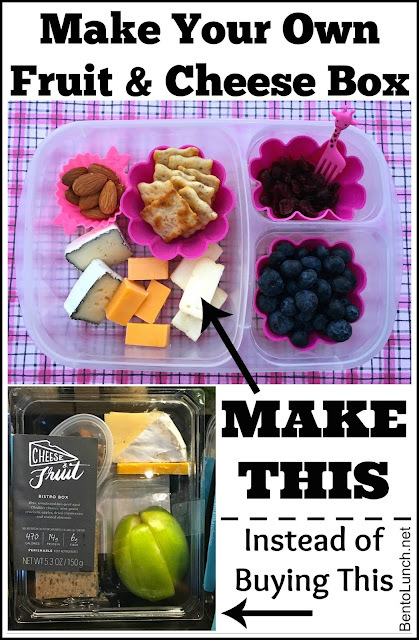 The cheese and fruit box! In the store bought box, there are three types of cheese (brie, cheddar, gouda), some crackers, dried fruit and nuts, and some green apple slices (less than half an apple, maybe a third at best). As with our first example, it retails for $5 and has approximately 470 calories. And, while I don't have the exact breakdown of the each individual piece, the entire BOX weighs in at 5.3 ounces, so you know it's not a large amount of food. 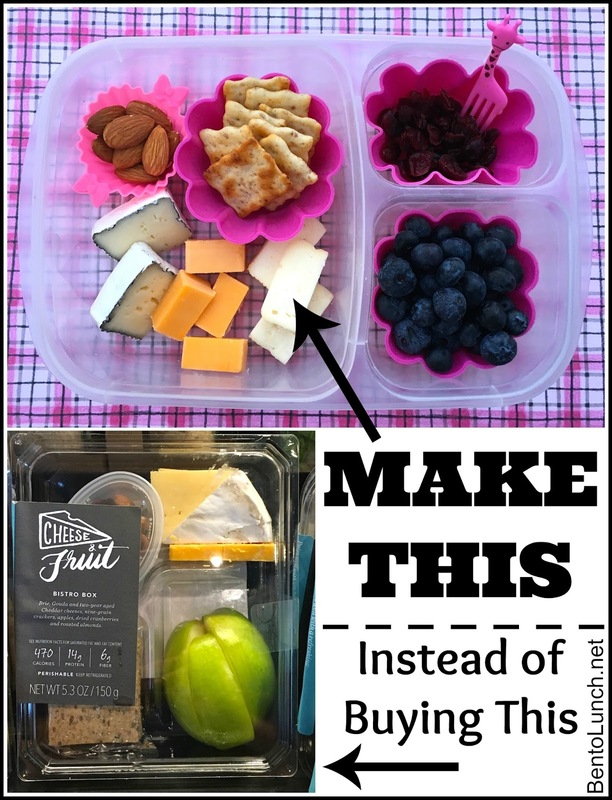 We evaluated what was in the box and decided to substitute the apple slices for other fruits. Apple slices need to be treated so they don't brown and we wanted our box to keep in the fridge. Alternatively, you could just pack a green apple in your bag and remove the fruit from the box. 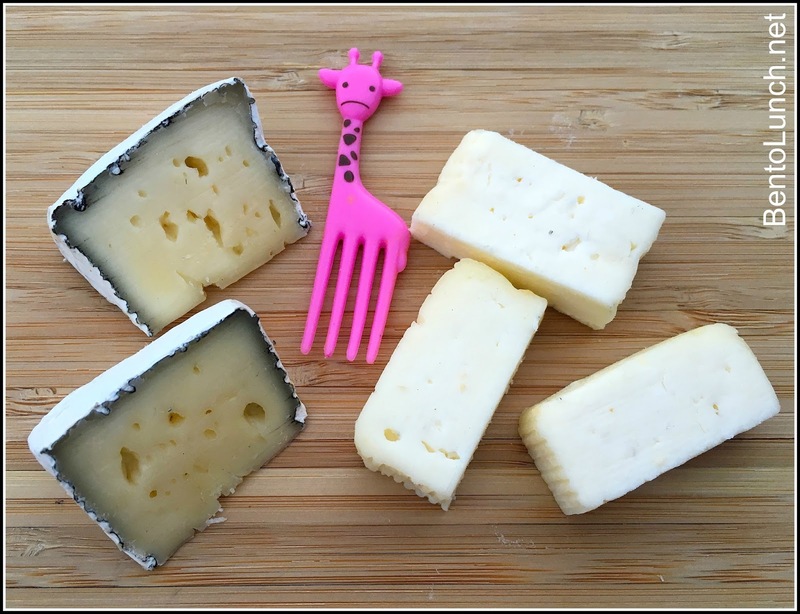 We decided to keep the three types of cheese, but swapped gouda for our new favorite petite breakfast cheese. While I was at IFBC (International Food Bloggers Conference), I got to meet the reps from Marin French Cheeses. After frequenting their booth, and eating a lot of cheese because cheese is awesome, I did get a chance to talk to them about working together for a blog post, because I had this post in mind. Who wouldn't want a box full of fresh cheeses in amazing flavors? Once I got home, they sent me a box with all of my favorite cheeses from the conference plus some new flavors I hadn't tried yet. The Petite Breakfast is my personal favorite, but we've enjoyed sampling the different Bries, including truffle and jalapeño, and the Camembert. I also met up with the reps from California Almonds while at IFBC. I already have a bit of a thing for almonds, and their table had the most amazing chocolate covered almonds and cinnamon candied almonds. I even went on a tour where I got to eat almonds right off the trees! They were the obvious choice for a nut option in this box. So, what's in our Cheese & Fruit Bistro Box? Since I did get some of my cheeses sent to me, I'm having to do a lot more estimating for the cost. I do know that the brie and breakfast cheese retail for about $3.75 each, and I used about a quarter of the disk of each. Let's just call that $1.85 for what essentially amounts to half a disk. $3.05 for the whole box, maybe less if your grocery prices are lower than mine in the PNW! Since I used approximately a quarter of the cheese rounds, let's say you made 4 boxes at a cost of $12.20. That's not even 2.5 of the store-bought ones! And you may as well make four since you have lots of yummy cheese. Once again, we packed our box in one of our EasyLunchboxes , so there's no additional packaging costs. And since they come in a set of four, you may as well pack all four of your cheese boxes. Want to pin this post for future reference? Just use the graphic below to save it for later. Or you can go right here on Pinterest to repin it. 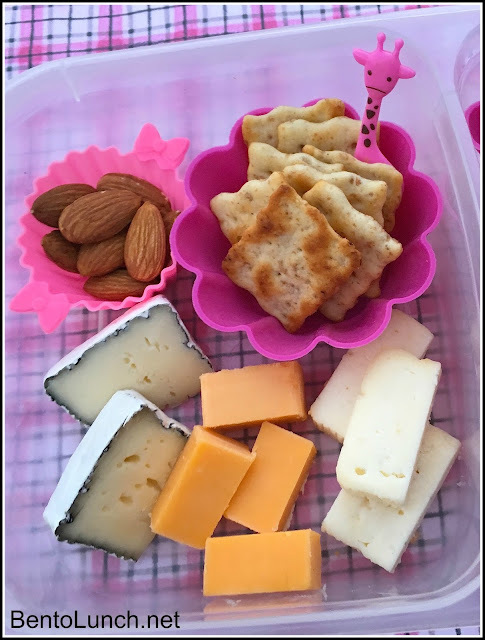 Thanks so much, Shannon, for including Marin French Cheeses in your beautiful Bento Lunch box! Yum!! 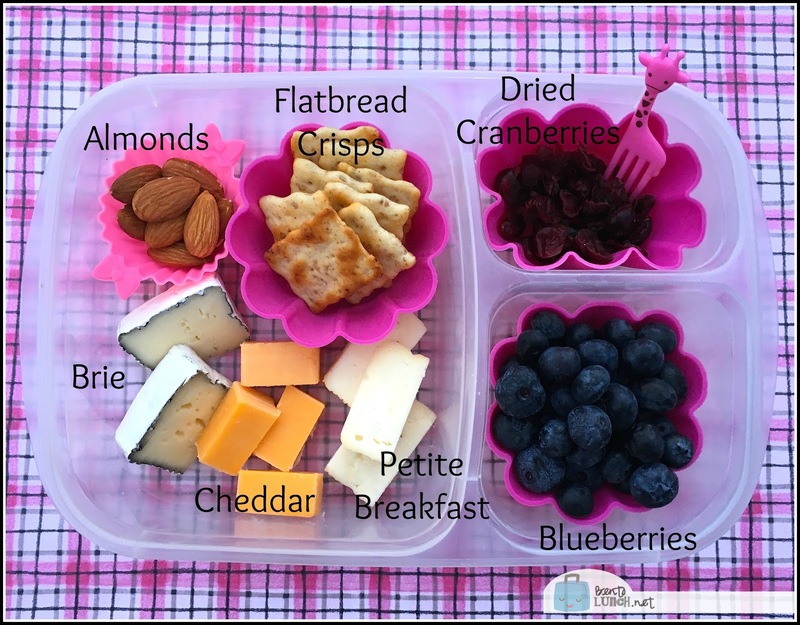 I love those for a lunch or shared snack! I keep the little lidded containers and use them for sauces,dressings, and such so it makes the $5 feel like an investment. At least that's how I excused it. But now I'm going to make these at home. I've seen cute little brie rounds that would be perfect for these at my grocer. Thanks for the post!